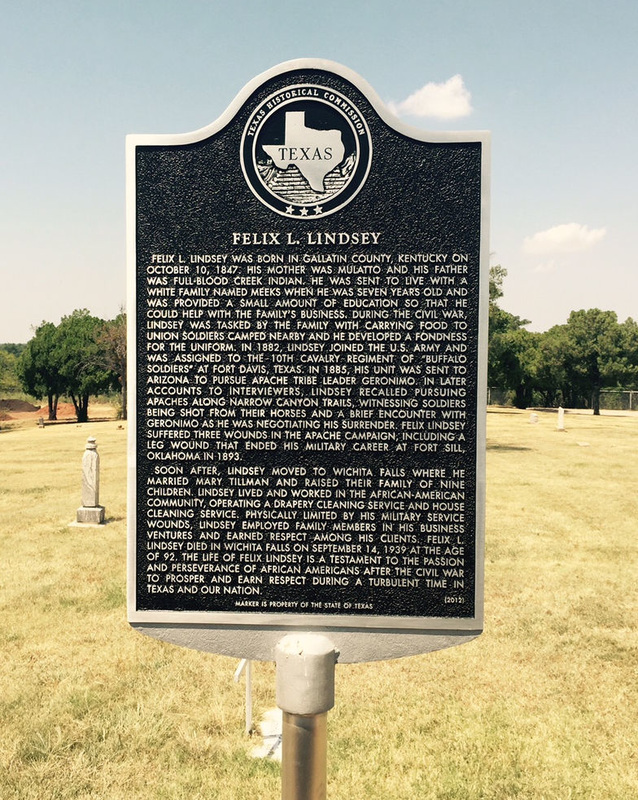 The marker is located inside Riverside Cemetery, 1810 Fifth Street, Wichita Falls, Texas 76301. GPS coordinates: 33-degrees, 54' 43.2", -98-degrees, 30' 28.2". Felix L. Lindsey was born in Gallatin County, Kentucky on October 10, 1847. His mother was mulatto and his father was full-blood Creek Indian. He was sent to live with a white family named Meeks when he was seven years old and was provided a small amount of education so that he could help with the family's business. During the Civil War, Lindsey was tasked by the family with carrying food to Union soldiers camped nearby and he developed a fondness for the uniform. In 1882, Lindsey joined the U. S. Army and was assigned to the 10th Cavalry Regiment of "Buffalo Soldiers" at Fort Davis, Texas. In 1885, his unit was sent to Arizona to pursue Apache tribe leader Geronimo. In later accounts to interviewers, Lindsey recalled pursuing Apaches along narrow canyon trails, witnessing soldiers being shot from their horses and a brief encounter with Geronimo as he was negotiating his surrender. Felix Lindsey suffered three wounds in the Apache campaign, including a leg wound that ended his military career at Fort Sill, Oklahoma in 1893.